DILO KE BADSHAH @iamamirofficial picks up the #HBLPSL 's first ever hat-trick! HOWZZAT?!?! 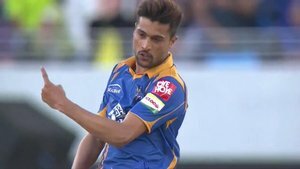 @iamamirofficial sends @Newbigdog 's bails flying to pick up @KarachiKingsARY 's fifth wicket. @iamamirofficial sends #ZohaibKhan back for zero as @lahoreqalandars start to lose their way. I'm from Karachi But I'm Supporting #PeshawarZalmi ???????????? What a comeback by Amir ! #Hatrick #PSL2016 #KarachiKings #KarachiJeetayga "